I have had the most wonderful day, doing some research for my next book in the John Oxley Library here in Brisbane (see right). Just about all my other books, under both names, have been set in other (more exotic) places. But this one is about a shipwreck off the Queensland coast, so I’ve been poking around in Sunshine Coast history (I can’t tell you how exciting it was when I realised there were PADDLESTEAMERS!!!) and, because a few scenes are set in Brisbane, my home town, in 1901, I have been challenged for the first time with researching local history. Yes, local history for local people. It sounds so mundane, but it’s not. On the one hand, it’s heaps easier than researching, say, the history of the tsars (for my Kim Wilkins’s novel The Veil of Gold. If I want to know what Brisbane looked like in 1901, I just stand in the Queen Street Mall and look up. But in other ways it has its challenges. Brisbane’s history has not been widely written about or represented, so sometimes my imagination ends up in a blank cul de sac. I know there’s a window in here somewhere, but did it face north or south. 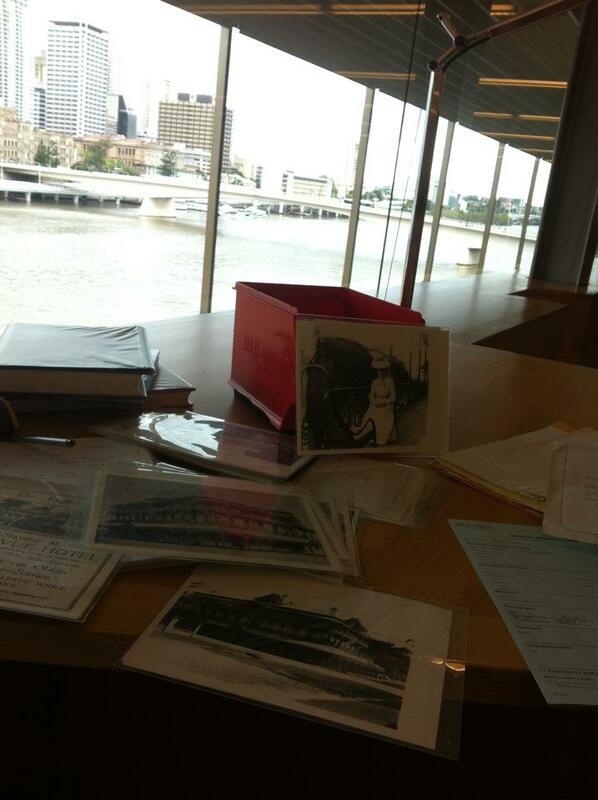 So, today I went up to the John Oxley library, because it is a repository for Brisbane historical stuff and things. I have a key scene, an important social function, set in the Bellevue Hotel, which was built in the nineteenth century but demolished in 1979. I had a little bit of an idea what the outside looked like, but no idea about what view there was from the verandahs, or what the fittings and furnishings looked like. The wonderful librarian gave me a box of photos and a folder of newspaper clippings, and away I went. I found a photo of a woman in 1903 sitting on the verandah (see above) with a clear view of Old Parliament House and the gardens, and a list of auctioned antique items such as cedar folding card tables and dressers with wing mirrors. I found a long description of the entrance and courtyard of the Hotel from 1898 and building notes and ownership logs. The scene, which had been floating around in a brownish space (I knew there must be chandeliers, but didn’t realise they’d be gaslight), began to take shape. I still have so much research to do, but the book is nudging 90 000 words so it’s about three quarters done. I’m on the home stretch with a little help from a library. Aren’t they the best places on earth (and check out the view from the reading room; not bad, eh)? your research sounds like loads of fun! wish I could help 🙂 can’t wait for the next book! Press On!